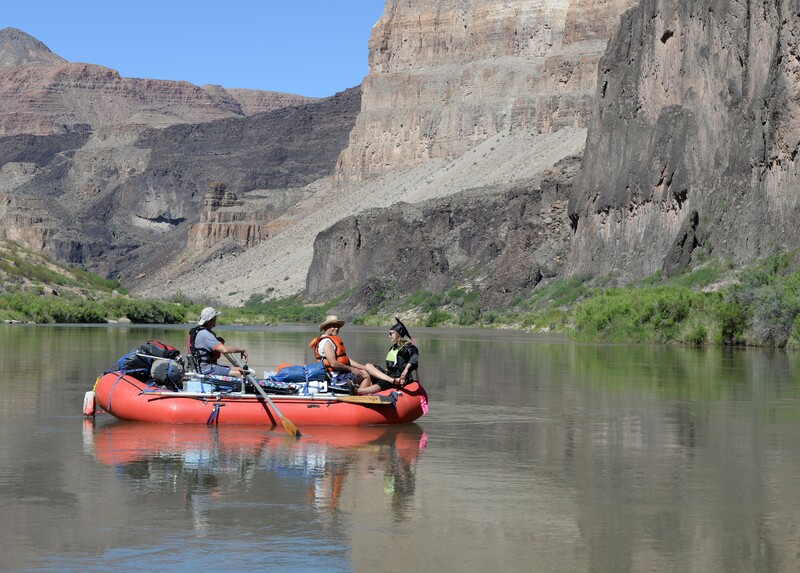 Colorado river trips through the Grand Canyon begin at Lee’s Ferry, a sprawling dry, dirty launch ramp linking a parking lot to a broad calm stretch of the enormous river. My sheer dumb luck recently rendered a permit for me to assemble friends and boats –and beer– for a nearly three-week tour. Once boaters depart there’s no going back. Floating through the Grand Canyon with friends. The river descends quickly into Marble Canyon, a gorge so desolate it was selected for release of California Condors when they were first re-introduced into the wild. Boaters must pack in everything they need. No road reaches the river for 226 miles. Of all the commodities boaters cherish, beer is possibly the most esteemed. If one group of river runners forgets or loses something, a dishwashing sponge, say, left to dry on a rock, or through miscalculation, a coffee supply, the currency of exchange is beer. Each trip member carefully calculates how much beer the boats can reasonably carry without actually sinking. And so, on a recent launch day, I was dismayed when the Sierra Nevada Pale Ale I had indulged myself in tapping –while hauling gear from truck to boat–tucked into a Thermos can-holder, disappeared while I was running an errand. I had gone in search of the satellite phone that had been left at the house of a nearby friend of the man from whom I was renting it. The SAT phone is required by the National Park Service for private (non-commercial or unguided) trips like ours. When I returned with the small yellow water-proof box carrying the emergency phone, I went looking for my beer, finally calling out, thinking I had simply misplaced it. “Has anyone seen my beer?” I asked. To my alarm, a new boater who we will call “Alex,” a wiry man who joined the roster late in the planning stages and a relatively unknown to me, confessed to pouring it out, thinking that someone had forgotten it. We would be spending 20 days on the river together, me, Alex and 12 other people. We would urinate in each others’ presence, we would share every meal, and defecate into the same ammo can every day. Every trip forms a tribe among its members, sometimes so strong that familial bonds form that last a lifetime. If we had a cousin, a tribal member, who thought it was okay to pour out, to simply waste the precious substance of life in the canyon, this trip could go very, very wrong. This fact that he confessed, outright admitted to the crime, indicated just how naïve this man was. It did not portend well. I tried not to express my dismay. I quelled my outrage. I tried to like Alex anyway. But it got a lot easier fast. Alex had only run the entire river as a boatman once before and his confidence was a delicate thing. His humility showed through. Not much more endearing in a man, really. At our first camp, perched above Soap Creek Rapid, the constant roar reminded me of the real hazards of river running, and my crying over spilled beer came to rest. Alex proved to be a competent camper, not parking his tent in the trail, carrying an extraordinary amount of group gear in his relatively small gray boat, always eager to fit into the dishwashing line. His green enchiladas was the best meal on the whole trip. The Dutch Oven has been the standard cooking pot for everyone, anyone from cowboy to fishing guide west of the Platte since Lewis and Clark first paddled upstream in 1804. The heavy iron pot is so heavy that when it contains a meal for 14 people, it is still hard to tell whether it is full or empty by lifting it. This is one of the many communal items carried on Alex’s raft for the duration of our 20-day, 14-member river trip. Alex also carried two guitars, a bathtub-sized dry-box filled with kitchen supplies, several water jugs and just about anything else anyone asked him to carry. Alex wrote funny ballads about river life and played them on his guitar around the campfire at dinner time. 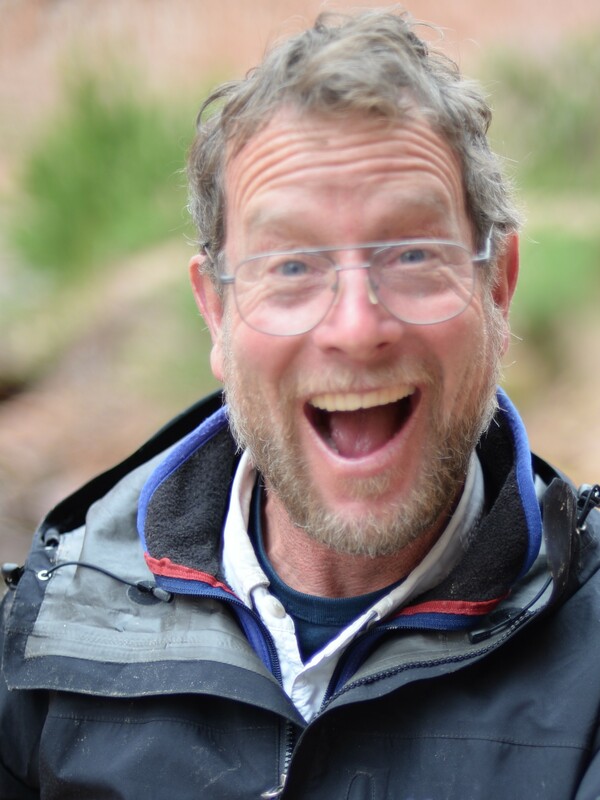 Among these tunes, he ceaselessly practiced “Pomp and Circumstance” in anticipation of his daughter’s arrival on the trip, which was to occur on Day 8 after she hiked the ten-mile Bright Angel Trail to join us. His daughter, who we will call “Courtney,” would be missing her graduation ceremony at Colorado College where she had just earned a degree in Film and New Media Studies. By the time Courtney actually appeared on the scene, the simple melody was so stuck in our heads, we were all mindlessly humming, whistling or tapping to a subconscious version of Pomp and Circumstance. It was a wonder that on the appointed day when Alex produced the cap and gown he had carefully packed for the surprise ceremony, carried out on a steep slope of sand several miles downstream, Courtney erupted in delighted surprise. The Trip Leader, who we will call “Steady Freddie,” arrived in good time, donned a purple cape, and spoke eloquent words about family and arrival. The Graduate, at right, with Herbie and Vic. Then the camp collection of instruments, including possibly but not limited to ukulele, nose flute, guitar, and very tired larynxes, produced the familiar tune with unexpected brilliance. Even the cooks stopped their slicing and dicing to fold their hands behind their backs in ceremonious appreciation. Yes, Alex would grow to be a luminous figure in my mind, not only for his creativity, humor, musical courage, and fathomless love for his daughter, but in his bright and positive approach to any confrontation or challenge. So when the sad day of our departure arrived, I could think of no way better to express my love for him than to remind him how far we had come. And how better than to ask politely for the beer he held in his hand on that hot, dirty, boat ramp, then slowly pour its contents into the sand.